Two years ago I posted “Sincerest Flattery in Tourist Lands,” highlighting a few notable examples of places outside New Orleans that mimic the famed French Quarter. Since that time I have discovered so many more such examples of the “sincerest form of flattery” that it’s worth revisiting the subject. Ranging from careful replication of what is sometimes called the “French Quarter Revival” style in resorts and theme parks to hackneyed adornments on otherwise ordinary apartment complexes, French Quarter-style architecture dots the American landscape. Of course what we call French Quarter-style architecture is in fact far from unique to the French Quarter. Many New Orleans structures outside the Vieux Carré also have original ironwork, and many more have added it. Many cities in the South (Mobile, Alabama, Galveston, Texas, and Savannah, Georgia, among them) and the Americas, including Tampico, Mexico, also have ironwork designs that owe to a shared Latin past. As geographer Richard Campanella has argued in Geographies of New Orleans, the “aesthetic appeal of the swirling patterns of iron lace” is easily exported far and wide. 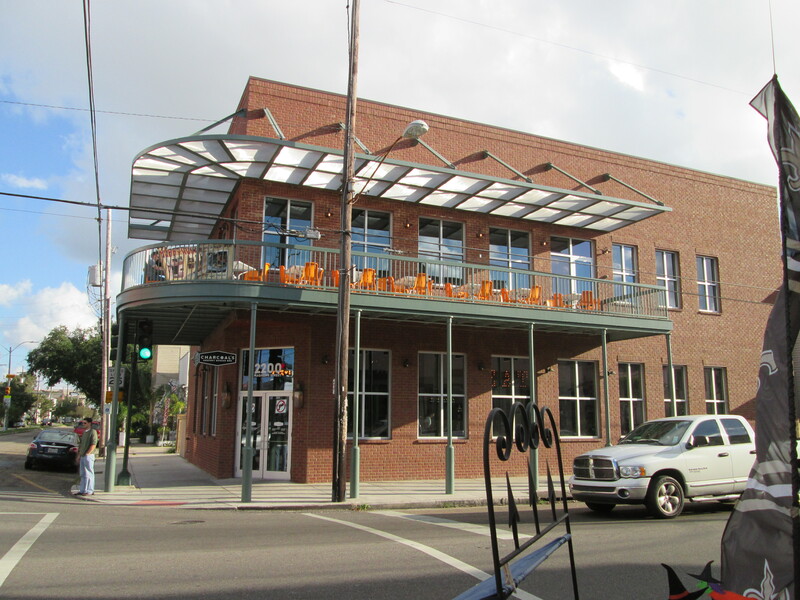 This recently built burger joint at Jackson Avenue and Magazine Street in the corner of New Orleans’s Irish Channel neighborhood sports French Quarter Revival style. Photo by Infrogmation of New Orleans, CC AT-SA. The stereotypical iron-lace galleries that grace many buildings in the New Orleans French Quarter include both “genuine” 19th-century examples and many later imitators. As I explored in New Orleans on Parade: Tourism and the Transformation of the Crescent City, by the middle third of the 20th century, preservationist appreciation of the tout ensemble, or the assembled whole, of the Quarter was enshrined in local law. 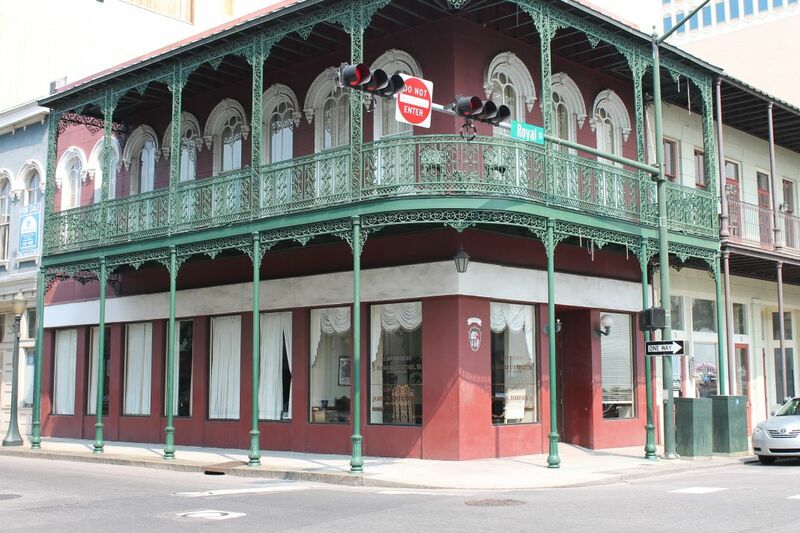 The Vieux Carré Commission–formed in 1925, chartered in 1936, and strengthened incrementally through court rulings thereafter–paid careful attention to the facades of buildings in the historic district. Although it protected against the demolition or careless alteration of many structures, it also privileged a certain look and was at times willing to approve new construction with evocative ironwork to replace actual “historic” buildings, especially for hotels. The first hotel to adopt what gradually came to be called French Quarter Revival styling was the Royal Orleans on St. Louis Street between Royal and Chartres streets. Originally the site of the historic St. Louis Hotel, which was so badly damaged by a 1915 hurricane that the owners opted to demolish it, faced no serious opposition because it seemed an improvement over the abandoned lumber yard along St. Louis. Constructed in 1959-60, it reflected the investment of the New Orleans philanthropists Edgar and Edith Rosenwald Stern and leg work of budding hotel developer Lester Kabacoff. Although it attracted no hostility, the wave of additional hotels its success unleashed made the Royal Orleans a point of departure for preservationists. Soon they had to contend with plans in 1963 for the Bourbon Orleans Hotel that was to replace the St. Mary’s Convent, with its historic Orleans Ballroom, the site of controversial “quadroon balls” a century before. In 1965 a building constructed on the “uptown-riverside” corner of Chartres and Barracks in the early 20th century as a macaroni factory in what was sometimes called “Little Palermo” was remodeled as Le Richelieu Hotel in the French Quarter Revival style. That same year, the Downtowner Hotel opened at 517-541 Bourbon Street where the old French Opera House had burned down in 1919. In 1968-69, yet another major new hotel, the Royal Sonesta, replaced the old American Brewing Company plant on half of one city square along Bourbon Street between Bienville and Conti streets. Although no one appeared eager to rescue a shuttered brewery that increasingly seemed anomalous in a fantasy of frilly 19th-century townhouses, by the late 1960s preservationists locked in battle with developers over what kind of French Quarter residents and tourists would have to visit in the future. They succeeded in getting the city to adopt a moratorium on new hotel construction in the French Quarter in 1969, but conversions of existing buildings into guest quarters would become the next problem–one that was far more difficult to curb. The last hotel projects grandfathered in at the time of the moratorium opened in the early 1970s. Chateau Le Moyne Hotel opened at 301-311 Dauphine Street in 1971, and the Maison Dupuy Hotel at 613-615 Burgundy Street opened in 1972. Of course, the ban did not apply outside the district. 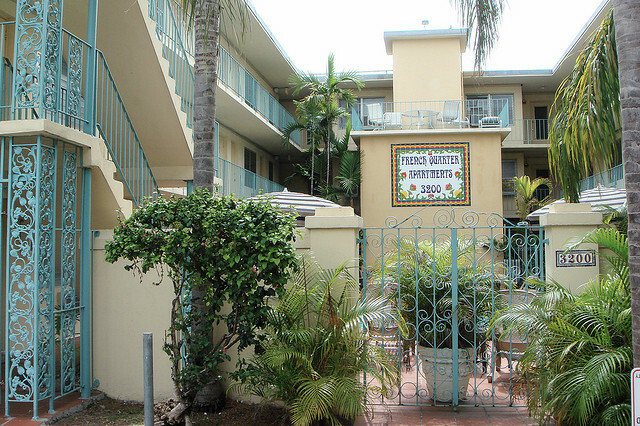 What is now called the French Quarter Suites Hotel opened in 1970 across North Rampart Street in Faubourg Tremé. Just as French Quarter Revival hotels embellished a neighborhood that was morphing into a caricature of itself, French Quarter replicas outside New Orleans became a hook for enticing tourists. In 1948 the Illinois Central Railroad, which operated passenger service between Chicago and New Orleans, created a small French Quarter replica exhibit at the Chicago Rail Fair. The exhibit touted the southern terminus for the railroad’s Panama Limited trains to its largest market for passengers. Twenty years later, the German-American Volksfest, sponsored by the U.S. Army in West Berlin, featured a French Quarter model along with a Mississippi riverboat and jazz music performed by the Olympia Brass Band to entertain American servicemen. 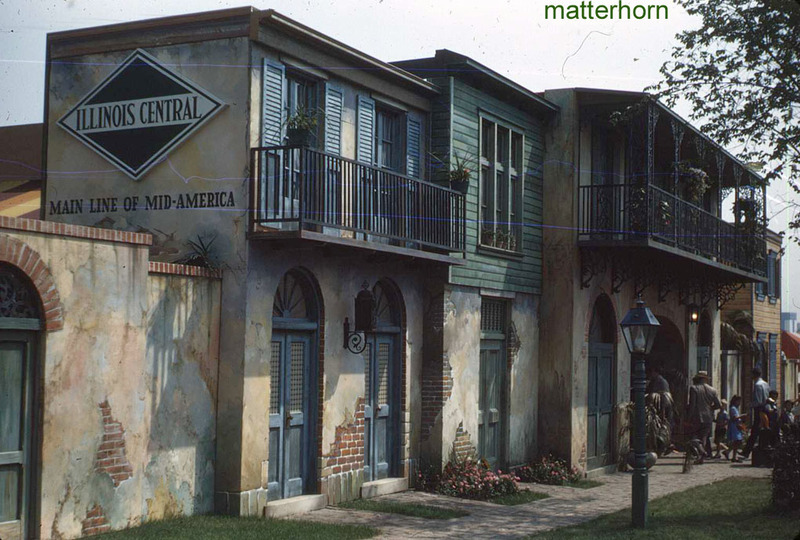 In later years, the Walt Disney Company renewed its longtime affinity for French Quarter theming, extending the concept to its central Florida park. In 1991 it opened Disney’s Port Orleans Resort, including a French Quarter “region” replete with more life-sized Vieux Carré-style buildings and even replicas of the Quarter’s traditional street lamps like those that had been added in the 1920s as embellishments in the real French Quarter. An unknowing viewer might mistake this nighttime scene of a French Quarter Revival building at the Opryland Hotel might for a scene along Royal Street. Photo by Jeffrey L. Cohen on Flickr, CC BY-NC-SA. Disney held no monopoly on making New Orleans part of a theme park environment. 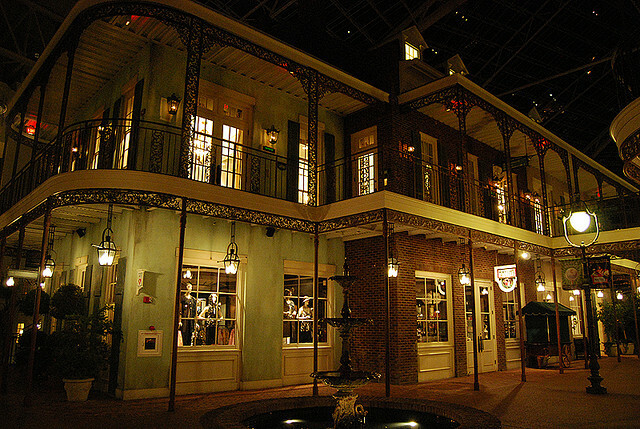 At the Opryland Hotel, a French Quarter under glass emerged alongside other themed attractions beneath its giant atrium. Nor did the French Quarter mimicry confine itself to tourist destinations. Unsurprisingly, as New Orleans’s French Quarter grew in popularity after World War II, it became the model for countless more modest imitations. Dozens of apartment complexes in the 1960s and 1970s adopted a loose approximation of French Quarter architectural motifs, including examples in Tuscaloosa, Alabama, and Miami, Florida, among many others. In the upscale Buckhead neighborhood in Atlanta, the French Quarter Apartments included an imitation of the Quarter’s lampposts and street signs. 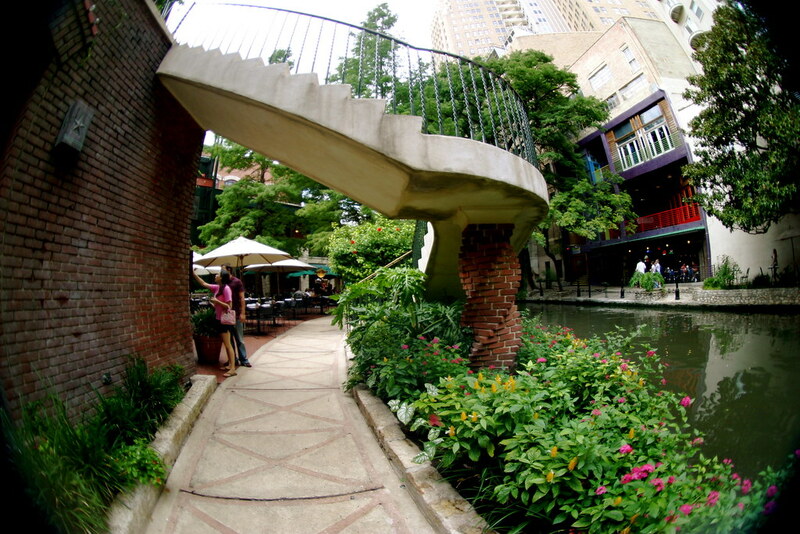 In Houston, Texas, a city that New Orleanians either envied or scorned, one could also find glimpses of New Orleans. Brennan’s, which emerged after World War II as a leading French Quarter restaurant, opened its second location in downtown Houston in the early 1980s amid a small cluster of Vieux Carré-influence office buildings. 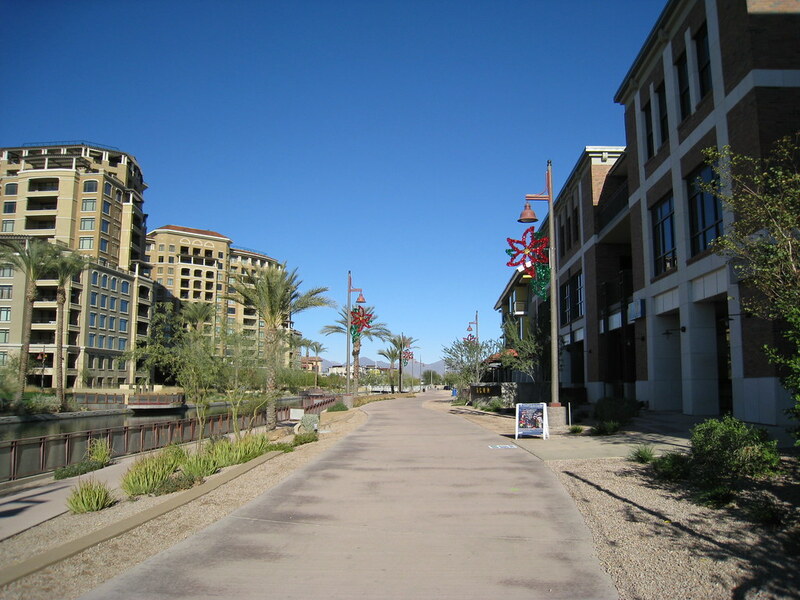 More recently, a larger mixed-use development nearby, called Calais, has appeared. The Fairhope French Quarter, a similarly ambitious re-creation, opened in Fairhope, Alabama, a small town on the eastern shore of Mobile Bay, in 1994. Although nearby Mobile shares with New Orleans a French and Spanish past that left it with longstanding examples of buildings that might seem right at home in the French Quarter, it seems likely that New Orleans was the bigger inspiration for the Fairhope imitation. Perhaps the most bizarre reincarnation of New Orleans’s famed attraction is the perennial French Quarter pop-up village that has been constructed and occupied in the ephemeral “Black Rock City” in northern Nevada for 17 days each August since 2011. The French Quarter Apartments in Miami. Photo by Drew Leavy on Flickr, CC BY-NC-SA. Just one year after Hurricane Katrina, when the city’s fate remained unclear, River Ranch, a 300-acre, master-planned, mixed-use development in Lafayette, drew the attention of the New York Times, which reported that some displaced New Orleanians were sinking new roots in the ersatz development and that in New Orleans the development spurred debate over whether ersatz architecture should have a place in the Crescent City’s post-Katrina recovery. The reach of French Quarter Revival architecture shows no sign of fading in popularity some fifty years after it became a noted cultural export. Historic New Orleans Collection, The Collins C. Diboll Vieux Carré Digital Survey, http://www.hnoc.org/vcs/. Richard Campanella, Geographies of New Orleans: Urban Fabric Before the Storm (Lafayette: Center for Louisiana Studies, 2006). Susan Saulny, “Replica of New Orleans: A Study in Urban Cloning,” New York Times, July 16, 2006, http://www.nytimes.com/2006/07/16/us/16replica.html. J. Mark Souther, New Orleans on Parade: Tourism and the Transformation of the Crescent City (Baton Rouge: Louisiana State University Press, 2006, 2013). ____, “The Disneyfication of New Orleans: The French Quarter as Facade in a Divided City,” Journal of American History, 94 (December 2007), http://www.journalofamericanhistory.org/projects/katrina/Souther.html. Anthony J. Stanonis, Creating the Big Easy: New Orleans and the Emergence of Modern Tourism, 1918-1945 (Athens: University of Georgia Press, 2006). The pageantry of New Orleans is on display for all the world as the Super Bowl returns to the Big Easy for the tenth time–tying the city with Miami as the most frequent host–and the first time since Hurricane Katrina. This year, with the game coinciding with the official twelve-day Carnival celebration (hence the nickname “Super Gras”), the city has pulled out all the stops in its savvy marketing of the New Orleans brand. The big show may be about the Ravens, the 49ers, and Beyonce’s halftime extravaganza, but tourism promoters have assured that the city will shine through it all and leave lasting impressions. To an even greater degree than on the eve of the 1984 Louisiana World Exposition, Super Bowl XLVII preparations have exerted a tremendous stimulus in New Orleans, catalyzing hundreds of millions of dollars in infrastructure improvements and frantic efforts to complete an overhaul of the Louis Armstrong New Orleans International Airport terminal in time to roll out the red carpet for Super Bowl visitors. On their arrival, football fans found an airport filled with soulful serenades as bands filled the concourses and baggage claim areas with jazz and blues. The same firm that produces the city’s annual Jazz Fest has also transformed the French Quarter riverfront into the Verizon Super Bowl Boulevard, another musically driven venue. And the company that builds most of the city’s Mardi Gras floats has built the longest one ever just for the occasion. Indeed, the entire city is flush with opportunities to imbibe New Orleans culture. The Super Gras scene represents a logical progression from the city’s longtime experience at wringing tourist dollars out of football’s biggest prize. At one time, the Crescent City’s music took center stage at local football games. In 1967, at the inaugural game of the city’s new Saints team, New Orleans’ Olympia Brass Band, one of its most important cultural ambassadors, high-stepped into Tulane Stadium (the Sugar Bowl), where it starred in the “Sights and Sounds of New Orleans” halftime show. The brassy show, complete with umbrella-toting second-liners, conjured visions of Mardi Gras for spectators. 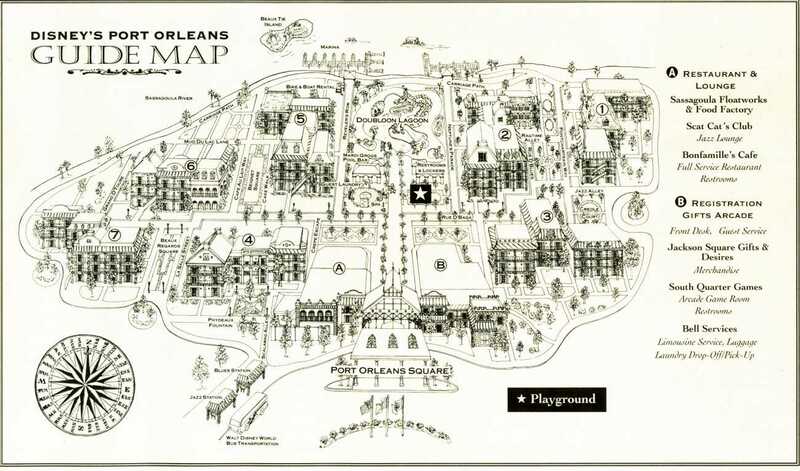 Staged just one year after Disneyland opened its miniaturized version of the New Orleans French Quarter, the show reflected the imagination of producer Tommy Walker, who had just left his post as entertainment director for Disneyland to produce nationally televised events. New Orleans hosted Super Bowl IV–its first– in 1970. Also played in Tulane Stadium, the game featured another Tommy Walker-produced halftime show titled “Way Down Yonder” and featured a mix of local and national musicians ranging from Al Hirt to Doc Severinson. The show culminated with cavalry and cannon in a reenactment of the Battle of New Orleans, after which the Olympia Brass Band staged a mock jazz funeral. Tonight’s buzz may be about Beyonce, Super Bowl commercials, and, yes, the Ravens vs. 49ers matchup, but New Orleans will make its most critical post-Katrina debut on the national stage. With the city in the midst of an ambitious (and controversial) push to nearly double the number of annual visitors by its tricentennial in 2018, it is a reminder that the so-called “City That Care Forgot” has not forgotten how much it cares about attracting tourists. Mention Naples, Florida, and images of ostentatious wealth quickly come to mind. On any given day, driving its residential streets requires dodging landscape company trailers for the hundreds whose buzzing equipment grooms banyan-lined, palm-studded green carpets of St. Augustine. Surely few places its size have more golf courses, gated “communities,” palatial homes, in-ground swimming pools, posh boutiques, and high-luxury cars (The town’s Ferrari Club is one of several local enthusiasts’ organizations). A trip down Fifth Avenue South conjures a vision that is one part Mediterranean seaside town and one part lifestyle center. It was not always so. For much of the twentieth century, as American Tourism contributor Aaron Cowan of Slippery Rock University argues, Naples mixed downscale “old Florida” with upscale nods to Palm Beach. Perhaps nothing symbolized the enduring presence of old Florida more than Swamp Buggy Day. Created in 1949 by enthusiasts of swamp buggy racing (which involved the ultimate “sport utility vehicle, a balloon-tired amphibious craft), this civic celebration grew around the sport and included a swamp buggy parade down Fifth Avenue South. Swamp Buggy Day Parade in the early 1950s. State Archives of Florida, Florida Memory. Worth Avenue, Palm Beach, 1946. By the end of the twentieth century, Fifth Avenue South was converging aesthetically more and more with Palm Beach’s refined thoroughfare. State Archives of Florida, Florida Memory. Eventually the parade shifted over to the Tamiami Trail (U.S. 41), a multilane highway that skirts “Old Naples” to the east, ending two blocks to the north of the city’s prettified main drag. Then last year the City of Naples, seeking to trim its budget, voted to stop sponsoring the annual event, turning over responsibility to the Collier County Sheriff’s Department. In a sense the parade, still highly popular, reflects changes all along Florida’s coastline, where tastes–and incomes–skew toward the high end while “old Florida” recedes ever farther inland. If U.S. 41 once divided the pricey from the affordable, in the last decade, as more and more tourists have made the destination home, the boundary has marched eastward to I-75 and beyond, propelling the market for affordable housing far away from the Gulf. Naples straddles two worlds: Ferraris centered on Fifth Avenue South and swamp buggies at Florida Sports Park, home of the Swamp Buggy Races, at the dead end of Rattlesnake Hammock Road–and, for a day, parading U.S. 41. As a New York Times reporter noted several years ago (Robert Andrew Powell, “On Florida’s West Coast, A Would-Be Palm Beach,” New York Times, March 12, 2004, F1), one ambivalent buggy racer and air conditioner installer who turned to selling high-end real estate mourned the gradual eclipse of old Florida. For now, though, the swamp buggies roll on in Naples. Tropical landscaping added to the refined appeal of Fifth Avenue South by the 1960s. State Archives of Florida, Florida Memory. In Eric Fischer’s representation of Las Vegas, the Strip appears as a large red boomerang. Fischer’s “Locals and Tourists” Flickr set, which expands upon his Geotaggers’ World Atlas, is a fascinating window into where tourists and locals spend their time in more than one hundred cities around the world. 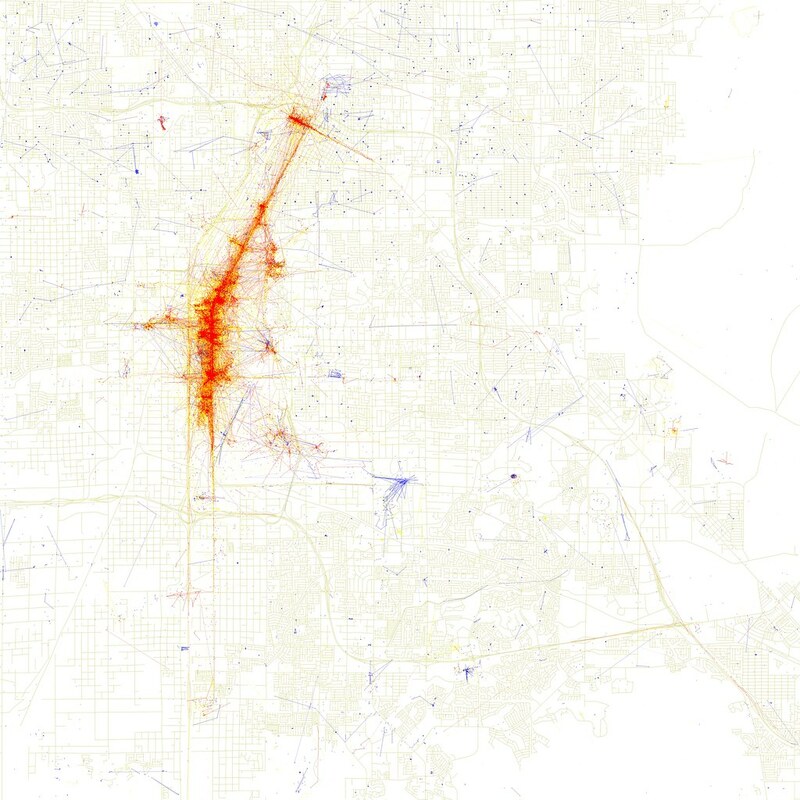 Based on public Flickr and Picasa APIs, Fischer’s maps graphically represent the so-called “tourist bubbles” that geographers have long described in cities. As he explains in his methodological statement, there is room for interpretation of these geocoded representations of picture-taking activity, but his analysis lines up very well with what we know about these cities. In the case of Las Vegas, it suggests the relative popularity of the Strip versus Fremont Street, Vegas’s much older downtown casino district, which appears as a small crosshatch to the north of the “red boomerang.” It also confirms the extent to which some cities manage to cultivate multiple tourist centers while others lean heavily on a single concentration. 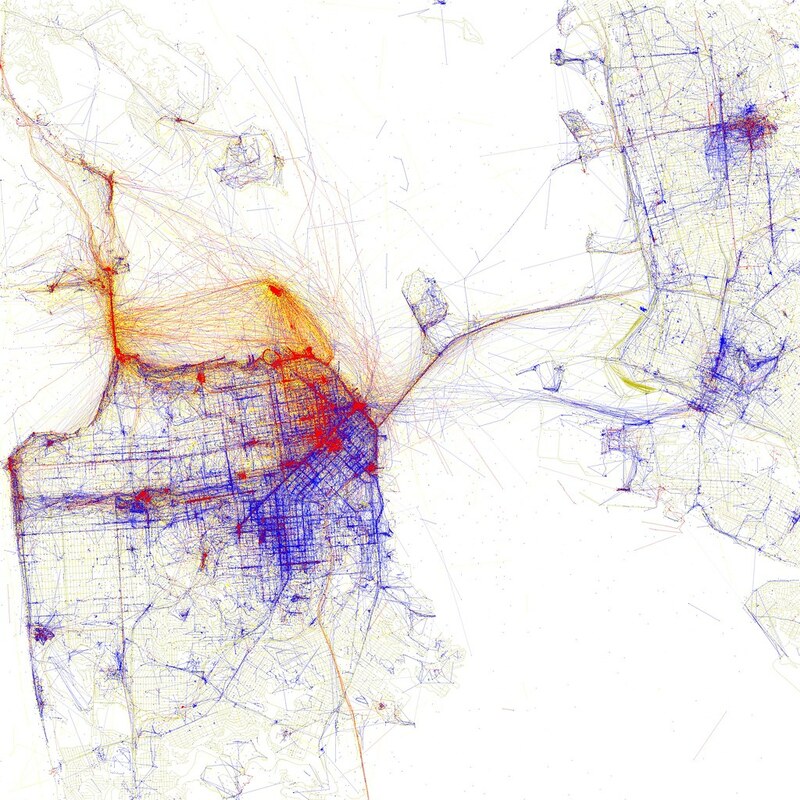 The map of San Francisco, for instance, reveals tourist bubbles in all the expected places. While Chinatown, the subject of an essay by California State University-Fullerton professor Raymond W. Rast in American Tourism: Constructing a National Tradition, appears as a red honeycomb, it shares tourist dollars with many other “red” spots, among then Alcatraz, Fishermen’s Wharf, the Coit Tower on Telegraph Hill, Cliff House, Golden Gate Bridge, Golden Gate Park, the Presidio, Union Square, Alamo Square, Haight-Ashbury, and Lombard Street. In fact, though, rather than a bubble, San Francisco seems more of a “tourist ring,” with tourists seemingly frequenting sites along the coast east of the Golden Gate Bridge to Fishermen’s Wharf, then southward through Chinatown to Market Street, then southwest and west along Market and in Golden Gate Park to the Pacific Ocean, and finally north along the coast back to the Golden Gate Bridge. While a sea of red dots cannot in itself prove how tourists move about a city, it gives a pretty good idea. It also suggests that wherever one finds a sea of blue dots might well become a tourist destination. To the possible chagrin of guardians of local culture, these maps might function much as airline magazines’ articles on discovering hidden treasures “off the beaten path” in heavily touristed cities. Moscow city officials are searching for their own version of Milton Glaser’s “I Love New York” campaign. 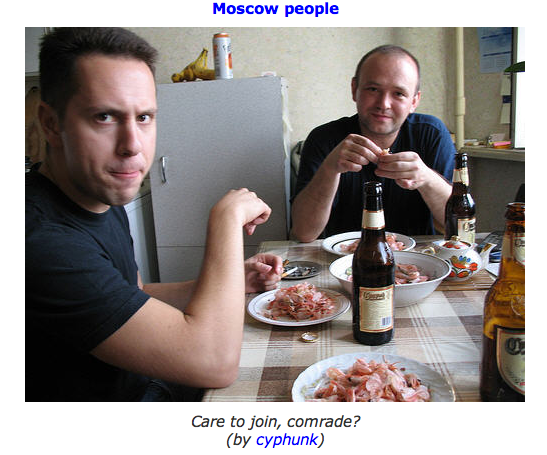 Through an open competition they hope to encourage the creation of an “original and organic logo to project Moscow as a global tourism center.” New York’s famous campaign, as Art Blake describes in his essay on New York City in American Tourism: Constructing a National Tradition, is credited with rebranding New York City as a tourist-friendly destination after decades of urban decline. It is understandable that Moscow, with its many connections to New York in terms of immigration and cultural outlook, would seek to imitate New York’s success. The right combination of design talent, urban management, and timing must, however, come together for places to truly reposition their global images. An open competition, moreover, is also a risky move for city officials. Would Glaser’s simple “I Love New York” campaign have necessarily won in an open competition?